Today Alaska Airlines revealed the most substantial updates to its brand in a quarter century. Beginning today, and throughout the rest of 2016, Alaska fliers will see the visual updates in new signage at the airport, an all-new airplane paint job, a refreshed website and mobile app, and more. The visual changes unveiled today are the culmination of a number of cabin enhancements the carrier has made in the past year, which include free entertainment and premium just-released Hollywood movies, Tom Douglas signature onboard entrees and seatback power. “Our brand is our reputation and who we are as a company. The logo and identity, those are the outward expression of our strong commitment to our customers,” said Woerner. The two biggest changes to Alaska’s visual identity are in the bold new design of its name (or wordmark), and the iconic Eskimo that has graced the tails of its planes since the early 1970s. To the uninitiated, the updated wordmark may seem like a simple matter of font choice, but to Woerner’s team every stroke conveys something critical about the brand. “The clean lines and italics of our updated wordmark represent the performance and precision our customers have come to expect when they fly Alaska, from our pioneering 20-minute baggage guarantee to our industry leading on-time performance,” said Woerner. It was also important to the company to keep some equity from the wordmark that Alaska’s customers have come to know. The capital “A” in Alaska has been streamlined, but is otherwise very similar to earlier versions. To update the face on the tail, an icon so beloved that rumors in the late 1980s of a new logo inspired a “Don’t Touch the Eskimo,” resolution in the state of Alaska, the work started years ago. In 2013, the marketing team traveled to the airline’s namesake state to interview native artists. Their goal: modernize the Eskimo, while paying respect to all that he represents to the company and its people. Customers will see vibrant new colors in the fur-lining of the updated Eskimo’s parka, as well as in airports, onboard flights and online. 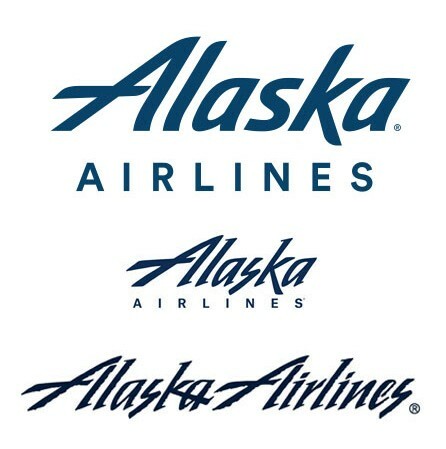 In focus groups before the brand updates, fliers unfamiliar with Alaska described its look as “corporate, functional and a bit cold.” The simple changes of streamlining the “icicle font” in the wordmark and adding green began to dramatically change people’s first impressions of the brand. For media: Images and downloadable b-roll available here. 21 comments on "Alaska Airlines unveils major brand updates"
My husband, two grown sons and I are absolutely loyal to Alaska Air, and we all like the new, refreshed logo & design. Love the font — way easier on these getting-older eyes, especially since I do much of our booking straight from your app. Love you guys! Keep up the great work! Onward and upward. I love the Alaska Airlines brand – congratulations on a smart looking refresh and best wishes for continued success! Fantastic, Amazing , em português ficou maravilhoso , com cores vibrantes . LOVE it !! Hurrah Hurrah to the VP of Marketing and her team behind it. You all deserve a free travel privileges on us! To brand heaven. Lovely work. The success here is that is: Memorable. Thank you for the invite to the event last evening. The official roll out was fantastic and the Eskimo’s name is “Charlie” at least to my kids and grand kids. Fantastic!!! We love flying Alaska Airlines, please don’t take away any more leg room in first class. My service animal is getting older and if you take away anymore we will have to look else where to fly.. He has earned his miles. I like the new changes, but I hope the “Northern Lights” design will still be available for the mileage plan credit cards, it’s a very unique design! I have to agree with you Nick, I love my “Northern Lights-themed” Alaska credit card! I’ve even received numerous compliments from people when I pull out the card to pay. Please keep the Northern Lights, Alaska! 🙂 P.S. Great job on the new look! Love it! I’m glad to feel the new spirit and the most thing I like is still I can see the familiar Eskimo face in the tail. I’m extremely pleased that Alaskan is now flying out of Tampa. I relocated from Seattle 15yrs ago and had to fly other airlines with stop over in Texas or Carolina. Yeah, now I can fly direct with my favorite airlines. Flew to Seattle in September and thoroughly enjoy a great trip. Same Alaska spirit. Love the changes! I’m a frequent flyer to Hawaii from San Jose, CA. The entire family loves Alaska Air, I especially like their website where I always do my bookings. It’s a very easy site to navigate with a calendar option to make it easier to choose flight dates. However, there is one tiny problem with service to Hawaii, in particular to our destination, Lihue, on the island of Kauai. Every single flight we have taken, in both directions, is always full, or at least about 98% full. When will Alaska Air start using larger equipment? I would love to fly for once on a flight that is not like being in a cattle car, lol. Alaska, when will you consider using larger aircraft to/from Hawaii? You have made sitting in coach much better with the design of the way the seats lay back. My husband and I are both tall , not small people and the way that the old seats were when someone in front of us put their seat back we had no leg room and our tray tables were pressing against our stomachs. We finally started flying with me in front of him so that I didn’t put the seat back. Now we can sit together. Thanks Alaska Air. I flew on SkyWest from OKC to Seattle and LOVED the space between seats, the first class and coach seating was awesome and the service was beyond compare. Thank you again, Alaska airlines! I live in Ketchikan AK and all flights there are great! Visited your city in Sept. last year via Norwegian Cruise Line…love it and the State of Alaska. It was a “Dream Come True” trip given to us by our oldest Son…Saw the iconic Airline up close and personal….Will be visiting again next year…Not sure if Alaska Airlines provides service from my California airpost. The new logo and aircraft livery are nice upgrades – more contemporary but it all still “feels” like the Alaska we know and love. Well done! The refreshed colors splash against the sky and makes me proud to fly Alaska Airlines!